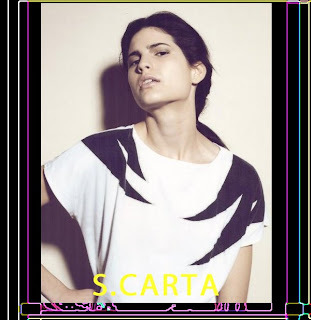 Stephanie Carta is with Priscillas (Sydney) & Elite (NYC). PONY RYDER: How did you become a model? STEPHANIE CARTA: My best friend in high school kept telling me the idea of me being a model. It came about when her cousin was doing a hair photo shoot and I was asked to model for it. PONY RYDER: On models.com you were referenced as one of the top 10 newcomers, as well as in Vogue Australia. What do you think made you stand out among the other girls? STEPHANIE CARTA: Difference, something different but interesting, personal style, right place at the right time, and a mane of wild darkness! PONY RYDER: Did that "nomination" influence your career? STEPHANIE CARTA: Well, it might have in some ways that I don’t know about yet. Really this happened after I had achieved a few really good show spots that I have been waiting for and have been working hard for, in quite a while. What followed has been not so much a big boom of overwhelm, but kind of just a few really special right pieces of work that I was ready for. I think this next season is really going to be the follow up of that statement. I’m so happy to be named in this sought after position though. As my booker in New York says, "it’s the stock exchange of the model industry!" PONY RYDER: Did you have to prove yourself all over again after the so called "scandal" in Australia? STEPHANIE CARTA: Oh wow! That’s a whole-another story. I mean yes, I did feel like I had and kind of have to keep proving myself after this unfortunate series of events happened. But I think, as time goes by, whatever, you know. I am me, and people who know that, and who know me, know that there’s better things to talk about. I and a good friend of mine made a couple of funny T-shirts out of it though. Now every time we meet. We make sure he buys me a burger for dinner! !It was annoying. But god, things like that happen sometimes, life isn’t perfect. None of us quite knew how to deal with it either. It’s OK now, though. PONY RYDER: You worked with some of the biggest names in the industry, walked for almost everyone… Would you describe yourself to be more an editorial or runway model? STEPHANIE CARTA: Both. I mean, those are almost two different occupations, that I am lucky to be capable of. 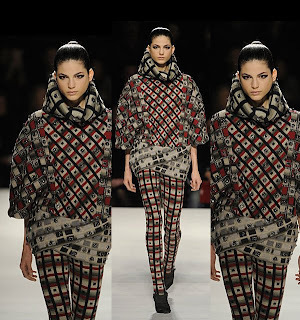 Runway is almost like a short film of fashion. It’s a great buzz and such a short event (usually), that has such an important audience. PONY RYDER: Out of all the shows you did, what would you say was the most demanding one? STEPHANIE CARTA: Demanding one? In what way, I wonder? What first comes to mind is Balenciaga. Not in a negative way though, of course. I remember someone saying that the air backstage at this show is very obviously different to every other show. It’s all done so precisely, professionally, yet fluidly. PONY RYDER: Who thought you how to walk on the runway, did you have a trainer? Is runway walk something you have to work on constantly, or is it like driving a bike, once you figure it out, you never forget how to do it. STEPHANIE CARTA: Kinda like a bike that you keep somehow making better as you go along. Mine, I think, in the beginning started by watching the big shows on FTV in high school when we got cable TV at mum’s for a little while. Then I just started the tweaking from there, depending what I came across, which is some good walking experience!! I get asked now to teach new girls how to walk! PONY RYDER: What do you wear for castings? 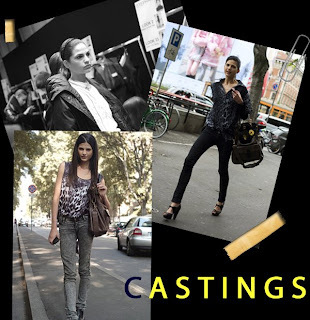 What is the most important thing that a girl should do to present herself well in castings? STEPHANIE CARTA: I just found recently the best two ALL ROUND pairs of casting shoes EVER. Besides the famous black feathered Givenchy ones my booker so happily persuaded me to get upon my last arrival to NYC. Two pairs of black ankle boots. The flats are well made from Italy with a subtle little extra on the heel. I always wear flats, except for really special events. Castings, and show castings definitively always require heels. So my new perfect heels are a gold find by Rick Owens. A black wedge ankle boot that feel like you’re walking on flat ground are oh so good to the eye.I dress according to my mood, what’s around, the weather, and the job I am going for, kinda like to get into the part just in case! PONY RYDER: Did anyone on fittings or castings ever ask you to change something about yourself? What to do in that type of situation? STEPHANIE CARTA: Yes, in a way. I’ve been scrutinized at one stage for being too "heavy" and at one stage for being too "thin". I mean there’s always the ‘having black hair’ thing. But in the modeling and beauty world I think there’s never one ideal perfection. It’s like a variety and you just learn as you go (also by speaking with other models and people in the industry). It’s when you come across the right people who think you are the perfect match for the job, that you realize to have faith in your own uniqueness. PONY RYDER: Do you have any kind of special preparations before doing a show? Did you ever have situations when you were booked for more than one show in a day? STEPHANIE CARTA: Well the aim is to go there as rested and ready for the job as possible. 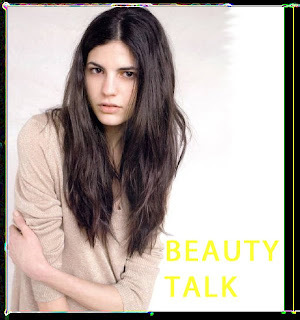 Have a clean face and clean hair.Just recently in Paris I had to make a major decision between two really great shows. One was to finally work with probably the most influential casting director and amazing label for the first time ever. And the other was a really cool show put together by a stylist’s work and persona I really love (Alistair Mckim) and the other two casting/production people who are the best (and who also cast me for Jill Sander). PONY RYDER: How do designers decide which girl will be wearing a certain outfit? Is the organization of a huge show like Balenciaga different to shows of other designers? STEPHANIE CARTA: Yes, the running of the Balenciaga shows and other ones around this level are done refreshingly professionally. It’s always a big process, and there’s a few different groups of producer/teams that seem to do all the main ones. There’s a big difference is experience when it’s done well and when it’s hectic, and the well done ones make it a lot easier for you to do your job well.I think the outfit choices are determined by a lot of different things, depending on the situation. 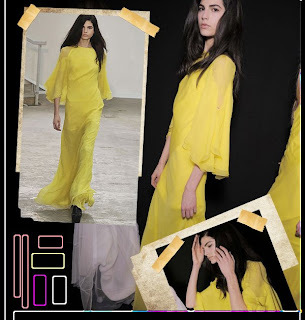 PONY RYDER: Tell us about the backstage during fashion week! Did you talk to any of the “supermodels”, got some advice? STEPHANIE CARTA: It all depends. I don’t try specifically hard to approach "supermodels" I just do my thing. Although it’s quite amazing to see some of them in real life after only knowing them as this somewhat image on screens and pages. When I see Aussies backstage its always cool, we bond automatically! But it’s quite amazing to have so many different nationalities in one space and I’ve really learned that a model’s life is such an insane life, you have to be quite onto it to be successful and living the life in that way. PONY RYDER: You switched agencies. My question is: by doing that do you get a totally fresh start, or is it more like "oh, new management, that's it". STEPHANIE CARTA: In my case it was the epitome of a totally fresh start! Almost like I just really became a model again and I was starting to forget where I was going or my purpose for it. For some its maybe "that’s it". But I think if it’s a big move it should feel like a good fresh start when you do. It always seemed like the hardest thing in the world to do, especially if you have such history. But it’s just the way that I feel personally is going to work better for now. It’s a gamble so you gotta take risks too! STEPHANIE CARTA: Yesss hahaha. There was a note written on the fridge in NYC. I don’t know what went on... I hate model apartments so much that when I’m put in one, I never go 'home'. PONY RYDER: You lived in Milan, Paris and NY. By your experience where are the best model apartments? And what is your favorite city? STEPHANIE CARTA: Hmm...I’ve thought about the best city thing...Best model apartment so far goes to the Big House in London. But I’ve been proposed for my next arrival to Milan what seems to be the most amazing Model Mansion for 4! Maybe I will do the model apartment in Milan. Milan seems to be the best for pure work. It’s nice, and the way they do things there, from what I’ve seen, is very organized and professional. I must say I love Paris, I spent 8 months there last year, the language and the processes are hard though. And 75% commission and tax. London is really cool if you have the right connections, but the weather and getting around thing isn’t the best. NYC - wow - it’s just everything, crazy cool and amazing. I am going to be based there after this next season. PONY RYDER: What is the hardest thing for you as a new model? STEPHANIE CARTA: Feeling you have to be proven to the right people. When they should already know! hahaFor me nothing happens overnight, all at once. It’s all worked really hard for, but I appreciate this because I learn a lot and life would be too easy otherwise. It’s hard being on the verge of getting even more amazing jobs that you feel so passionately about, and then the last minute fall through. It’s hard, but you really have to learn to trust your agencies and have faith that everything you get sent to is for a good reason to help you in your right direction. Also dealing with my vintage clothes obsession along the way and love of seeing my friends colliding with work commitments. You have to choose to be professional at the right time or you are wasting your time. PONY RYDER: What is your beauty routine? How do you keep your skin looking so flawless? STEPHANIE CARTA: I am lucky to be blessed with good genes. When you come across the right people to give you the right personal tips along the way it’s awesome. Fish oils are great, hydration, love and care as much as you can. Not too much sun. As natural products as possible, they sometimes even costs less too! PONY RYDER: Do you use facial sun block on daily basis or not? STEPHANIE CARTA: I think I’ve been living in two years of winter right now. But on my visit to Christine Chin in NYC, they taught me even in winter to wear sun block, it has to be the right kind especially for your face though otherwise it’s really clogging. Thanks for reminding me, I just got to the summer here finally. When I go to the beach I pretty much usually cover my whole body! I tan like a freak but I want to be careful! STEPHANIE CARTA: You are what you eat. PONY RYDER: What is your beauty obsession? STEPHANIE CARTA: My other beautiful friends! Right now my "red she says" lipstick and nothing else looks amazing. PONY RYDER: What are your make up bag essentials? 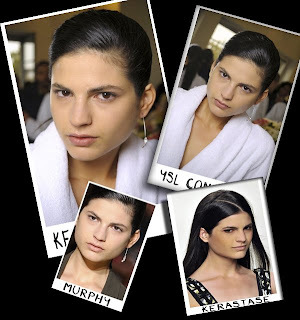 STEPHANIE CARTA: YSL Concealer, Lucas paw paw ointment, and at the moment YSL mascara too. PONY RYDER: And tell us, what products do you use for your hair? STEPHANIE CARTA: Well my hair is best non washed, as it’s so thick and dry it needs time to calm down!It’s really hard to know what to do with it sometimes and what’s right for it, because I think it has a mind of its own. The best I’ve come across so far is Bumble and Bumble and Kerastase Products, chosen depending on your hair. I really should get treatments more often. Also Kevin Murphy is an Australian who does some really great natural stuff that does wonders and smells like herbs - amazing. This summer in Australia it’s going to be wild free beach hair, fresh from the ocean, while I can. STEPHANIE CARTA: I’ve always been really athletic in school, followed by doing a lot of yoga and running in the years after. Now I am probably my most inactive -more active flying on airplanes. Spending so much time in winters and having such a worldly hectic work life makes things hard, when its part of our job to look fit. So I don’t go to the gym, I really don’t like them. I walk around lots because I have to for castings and it’s a nice thing to do. Also I try to keep my mind active, to make up for the lack of active exercise I miss. The genes thing again, too. Plus I know A LOT about health and biology thanks to my amazing naturopath here. PONY RYDER: When models say they eat healthy, what does it mean, that they eat salads or tofu? STEPHANIE CARTA: Well yeah, but "healthy", I’ve noticed, is different for each person, depending on how much they know. I’ve seen some models eat freakishly saddening low amounts of food. And others having a more laid back approach and being lucky, or compensating with gym etc. STEPHANIE CARTA: Wow. I’m a Taurus, don’t get me started. Lately I’ve come across so many great places to eat around the world.The steaks in ParisThe cod at Nobu in Londonthe Italian at Fritelli here in Sydney Thai fusion with lots of great herbs and spicesa great chicken burger with friendsI’m a bit over chocolate to tell the truth, and really sugary things, they just feel wrong.I love "superfoods" ie. PONY RYDER: Staying at Italy, do you get attached to the Italian life style, for example: drinking aperitifs? STEPHANIE CARTA: OMG. If I hear the word aperitif one more time....haha or get another marriage proposal from an Italian man I have never met before....But YES. My father is Italian! All of his family come from Sardinia. I never lived with him but I feel like Italian is definitively in my blood just waiting to come out. The Italians are lovely people and their food is amazing. PONY RYDER: What would you advise to new models? STEPHANIE CARTA: If it works it works! Seek the best advice you can from your peers, to decide what’s right for you in the industry and try to stay cool! PONY RYDER: Do you have any model friend you would like to see presented on Pony Ryder? STEPHANIE CARTA: Yes Lauren Brown, Catherine Edwards (They are about to hit the scene with me this season as their first)Tiah Eckhardt is a phenomenal woman who you may of already heard of too. All of the above and they are all from Perth, Australia. My sisters as we say. I love writing about them, they are amazing, physically and mentally wise. 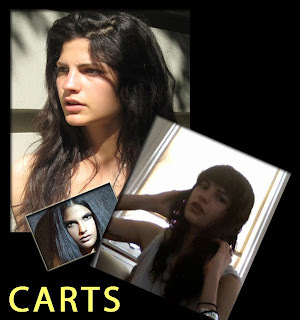 Interview with fashion model Stephanie Carta is original work and courtesy of Pony Ryder.